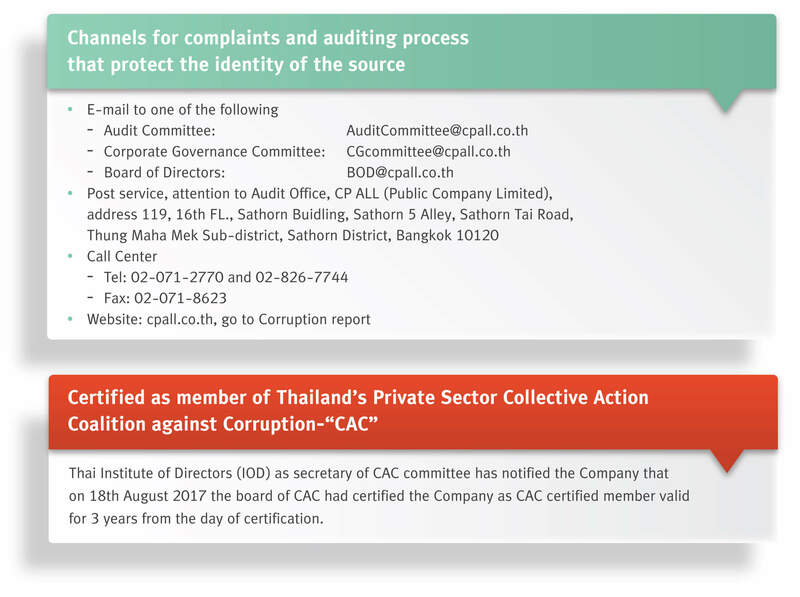 In addition to anti-corruption measures to reduce corruption risk, the Company also creates measures to help detect and report corruption risks in a timely manner. Communication channels were set and displayed on company’s website. These channels connect stakeholders, related parties, executives, and employee, enabling a channel for grievances, report corruption cases, or injustice. The Company prioritizes protection of sources, and have measures to protect the sources against reconciliation and threats thereafter. The Company also establishes measures for damage compensation, if occur, to the source. With regard to the Company’s operations in the past 5 years, there were reported cases of employee wrongdoing, with most of the cases being employees taking cash for personal use and eating products in the store without paying money. In 2017, we have developed strategies and channels for receiving complaint which is better to approach target group in every level. And, to make staff in every level of company to understand the anti-corruption regulations. So in 2017, we have found the increased cases of corruption and company can also set the corruption defensive measure, appropriately and accurately, which help to reduce repeated cases. The example of the corruption defensive measure in 7-11 store as follows. – The Store Manager is responsible for controlling and counting cash sales of employees of each shift. – FC is responsible for monitoring the work of the Store Manager who has to go to the store and count cash at the branch store. QSSI Team inspects the quality of products and services and monitors compliance such as keeping cash in the cash register as well as reserve cash outside of the cash register. Loss Prevention Team monitors information on the negative difference in the number of products from product checking and inspects the operations of store branches without prior notice, such as body search of employees operating the cash register, record of transactions and viewing the CCTV feed.